Using our perspective from the standards arena and hands-on work with safety professionals, we’ve put together observations on top trends to be aware of – and tips to put to use this coming year. Clarion Safety Systems, a leading designer and manufacturer of safety labels, safety signs and safety tags has compiled a breakdown of the most significant trends in workplace safety from 2018, as well as practical tips for improved product safety in 2019. “Whether you’re an environmental health and safety professional or a product safety engineer, this past year saw significant safety developments that can shed light on ways to improve warnings and reduce risk – both on pieces of equipment and on the walls of facilities,” says Angela Lambert, head of standards compliance at Clarion Safety. Clarion Safety has been involved at the leadership level in the U.S. (ANSI) and international (ISO) standards committees for decades. Lambert is currently a member of the ANSI Z535 Committee for Safety Signs and Colors and the U.S. TAG to ISO/TC 145. “Using our perspective from the standards arena and hands-on work with safety professionals, we’ve put together observations on top trends to be aware of – and tips to put to use this coming year,” Lambert says. 1. Fall Protection: Slips and falls are an all-too-common source of injury at the workplace. They're part of the reason why roofing is currently among the deadliest professions in the U.S.; between January 2017 and this past September, 64 roofers were killed on the job, mostly as a result of deadly falls. While most of these tragedies weren't national headlines, they were reported by local news outlets and also chronicled by OSHA, says Clarion Safety. As an example, earlier this year, a construction worker was killed in Colorado when he fell while installing metal roofing panels on a storage unit building. Following a review by OSHA, safety officials determined that the incident might have been prevented had the employer provided the proper fall protection equipment. The developer faces penalties of nearly $177,900. By truly investing in a solid safety culture – including using safety warnings to inform workers, guests and contractors of potential unsafe slip and fall hazards, and reinforce and remind employees about proper safety procedures and PPE – steps can be taken to make improvements, Clarion Safety says. 2. Workplace Violence: Each year, an estimated two million Americans are on the receiving end of the consequences of workplace violence, according to the National Safety Council. It's the third-leading cause of death among certain occupations. This past February, OSHA penalized a health care center for negligence in not protecting its workers from workplace violence. The fines – amounting to over $9,000 – stemmed from an investigation in which OSHA was alerted to five documented incidents of melees that occurred within the nursing home facility in 2017 alone. While no one was killed, several employees were injured. In addition to providing training on what workers should do when violence occurs – as well as tips for how to help people calm down during arguments – signage can be an effective way to reduce negligence and maintain order during a crisis, says Clarion Safety. "Do Not Enter" and “Authorized Personnel Only” signs can help to warn people that hostilities in any form or trespassing won't be tolerated. In the event of a crisis situation, an egress or evacuation safety sign system in place will help guide people to safety. 3. Hazard Communication: Hazard communication is a perennial problem for businesses. Hazard communication related to potentially harmful chemicals and substances and GHS labeling regularly makes OSHA's list of the 10 most common workplace violations. Such was the case in 2018, where it landed in the top three violations with 4,552 employers cited. As an example, in August, insufficient hazard communication resulted in a $189,200 fine for an Athol, Idaho-based lumber company. OSHA cited the firm for allowing combustible material to accumulate and failure to alert employees to the presence of hazardous chemical materials. Information about hazards – whether in the form of chemicals or general accident prevention – must be conveyed when they're present, says Clarion Safety. This can be done through safety signs, labels, tags and other types of warnings. Greater use of symbols: Labels and signs need to communicate warning and instructional information efficiently and effectively. 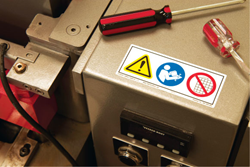 The greater use of standardized ISO safety symbols is a major trend to be aware of – and incorporate into warnings – as they can improve noticeability and overcome language barriers, Clarion Safety says. Precise, customized warnings: Customizing safety labels, signs and tags is a process that involves understanding the market, product or audience, and risk assessment, and then crafting the right, personalized warning needed for the situation at hand – all while staying within the framework of today’s best practices. It’s important to give thoughtful consideration to your custom warnings, and work with knowledgeable experts when needed, the company says. To learn more, viewers can visit the Clarion Safety blog where more details have been released on 2018 workplace safety trends and ways to improve a 2019 warning labels program.